It is unfortunate that Chinese wine drinkers seem to be deserting the produce of their own vineyards for imported alternatives. In my experience, the quality of the best Chinese wine has recently turned a corner — in the right direction. For years, it looked as though Chinese producers put more effort into the packaging than the liquid. After all, until fairly recently the great majority of Chinese consumers had no experience of what wine should taste like. So the many fraudsters, the sort who labelled questionable concoctions as “chateau Lafeet” or “Bordeaux Port”, could get away with murder. The rampant fakery of old, as well as food safety scandals, presumably played a part in encouraging the country’s wine consumers to see imported wine as a more reliable product. It also tends to be priced much more sensibly. China’s wine producers are apparently still influenced by old gifting habits, with too many overpriced bottles aimed at providing a patriotic official with a domestically produced status symbol rather than a good-value drink. The great majority of the imported wine is fairly ordinary stuff. France in general and Bordeaux in particular used to be the model for all wine to aspire to in China, but imports from Chile and Australia have surged in the past year or two, thanks to friendly trade agreements. Spain, too, offloads vast quantities of incredibly cheap wine to China. Meanwhile, at the top end of the market, Chinese consumers used to be seen as ignorant stooges by the many exporters who cast China as their potential saviour in a sluggish European wine market. But they are becoming increasingly sophisticated and knowledgeable. The global leader in wine education, the London-based Wine & Spirit Education Trust, has almost as many Chinese students as British — and the University of Bordeaux is teeming with them. Chinese producers are nothing if not determined and efficient. Last year, the country’s total vineyard area overtook France’s to become the second biggest in the world, after Spain’s. Often with local government help, producers have invested heavily in new vineyards and built wine “chateaux” more fantastic, quite literally, than any in the Loire or Hollywood, all aimed squarely at Chinese wine tourists. If wine imports continue their dramatic growth, then Chinese exports will have to increase considerably. So far they have been modest, but UK consumers have apparently shown more interest than expected in such Chinese bottles as have so far been presented to the customers of Sainsbury’s supermarket and the off-licence chain Wine Rack. There is one potential handicap, however. The countries that have had the most success in establishing export markets in the modern era have had a USP. New Zealand has carved a niche for the world’s most valuable per-bottle prices by offering uniquely, refreshingly fruity Sauvignon Blanc. Australia saw massive success with its friendly Chardonnay and rich Shiraz. Argentina has blitzed North America with its bold Malbec. But Chinese vineyards are dominated by the red Cabernet and Merlot grapes that grow in abundance all over the wine world — not least in Bordeaux, which produces massive quantities of inexpensive examples every year, typically made by co-ops that do not have the debt that recent investors may be saddled with. 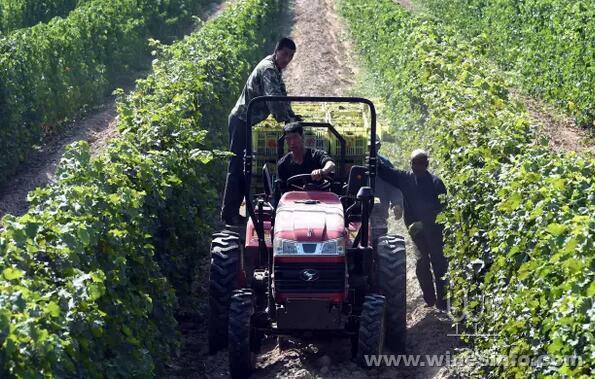 The reaction of many Chinese producers to market trends has been to acquire foreign vineyards and wineries. Chinese investment in Australian wine production, in particular, has recently gathered pace, and current estimates are that almost 200 (relatively minor) Bordeaux chateaux are in Chinese hands. Chinese buyers were out in force once more at the primeurs tastings in Bordeaux at the beginning of this month. One thing seems sure: Chinese influence in the world of wine will only increase.